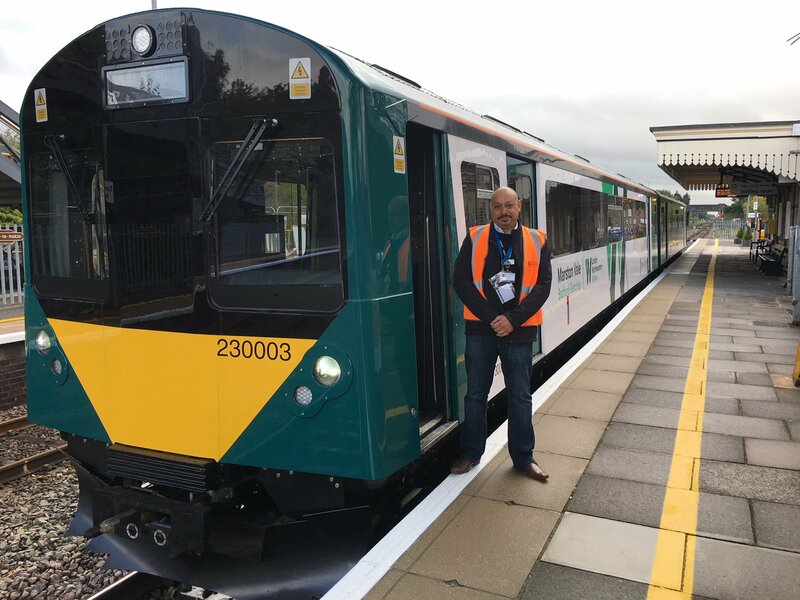 The first production version of the Class 230 diesel train developed by Long Marston-based Vivrail made its debut on the rail network on the Cotswold Line on Monday, September 17. Unit 230003, which has two coaches, has been converted from former London Underground D78 electric trains that used to operate on the District Line. It will operate passenger services on London Northwestern Railway's Bedford to Bletchley line, along with two sister sets. Ahead of its delivery to LNR at Bletchley depot, 230003 made a test run from Long Marston to Honeybourne and Moreton-in-Marsh, where the photograph was taken, then headed to Evesham before returning to Long Marston. It left Long Marston for Bletchley the following day, Tuesday, September 18, running south along the Cotswold Line to Oxford, then travelled north to Coventry before reaching Bletchley via Rugby and Northampton. The three Class 230 trains ordered by LNR are expected to enter passenger service in December. Another five sets, with three coaches each, are on order for use by the new Wales & Borders Trains on the Wrexham to Bidston line, which links North-East Wales and Merseyside, the Conwy Valley Line to Blaenau Ffestiniog and some Chester to Crewe services. They will enter service next year. Vivarail was founded by Adrian Shooter, the former chief executive and chairman of Chiltern Railways, with the aim of providing a low-cost diesel unit by adding diesel generator sets based on Ford van engines under the floor to drive the existing electric traction motors on D78 trains that were being withdrawn by London Underground. Vivarail has a large number of D78 coaches stored at Long Marston awaiting conversion once more orders come in. The trains' cabs have been reinforced and fitted with modern controls, while the interiors have been modernised and a toilet added in one coach. The design allows them to be adapted to run off batteries in the future. The prototype set, 230001, has previously made a number of test runs on the Cotswold Line.